April 11 – The State of the Connected Home – Hosted by Whirlpool Corp.
October 3 – The Future Kitchen – Hosted by Whirlpool Corp.
We are excited to announce that Thermador will be hosting our Wednesday KBtribechat discussion hour at KBIS. We will be getting together during our weekly KBtribechat hour to network, share show highlights on social media, plus see the latest from Thermador first hand! Thermador’s booth number is W1749. We are looking forward to seeing you there! Their discussion questions will be posted on January 4th. We have a new KBtribechat group Pinterest Board for KBIS sharing. Let us know if you’d like a Pin-vitation! Plan to #KBtribechat Wednesday at #KBIS2015! 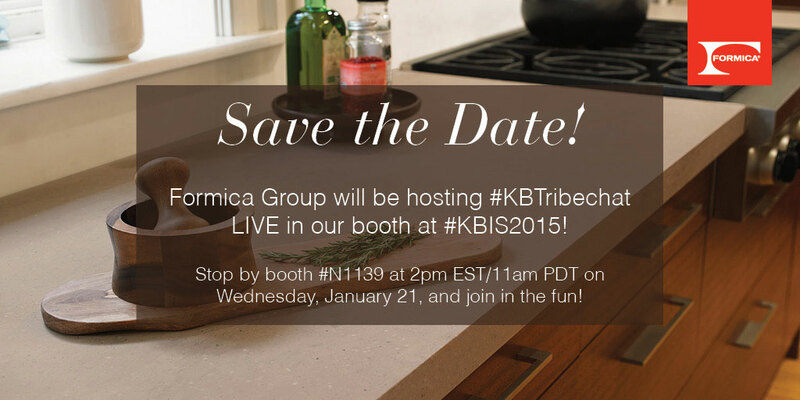 Formica Group is sponsoring our January 21, 2015 KBtribechat. Plan to join your KBtribe friends in person at KBIS for our weekly, hour long Wednesday discussion. We can’t wait to see everyone there!